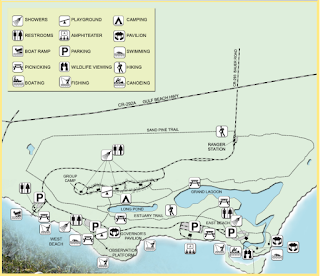 Map of Big Lagoon State Park Food, Shops and Rentals. Enter Big Lagoon State Park from Gulf Beach Highway. Stop at the Ranger Station to register your vehicle. Bauer Road continues through the park. The camping area entrance will be on your left. Further down the road, the entrance to the boat docks and boat parking lot will be located on your right. Continue to West Beach which will be located on your right and then further on to East Beach. East Beach is the farthest parking lot. 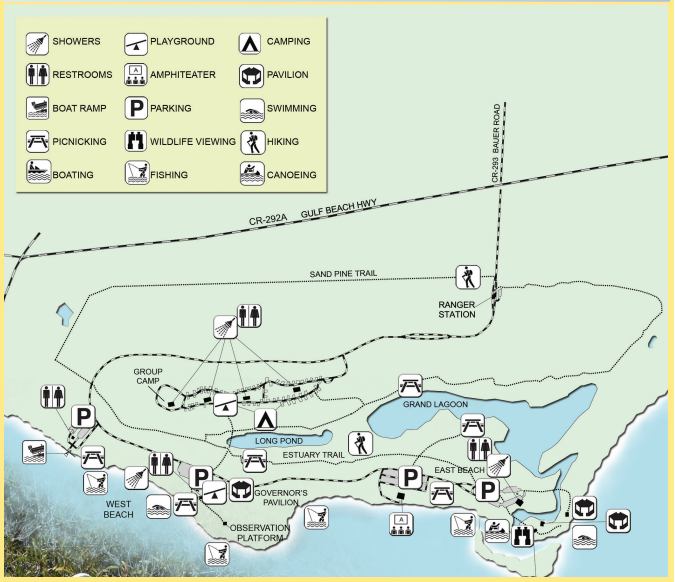 Equipment rental launch sites for paddleboards, kayaks and canoes are located at East Beach. Big Lagoon State Park is managed by the Florida State Park System which is a division of the Florida Department of Environmental Protection.